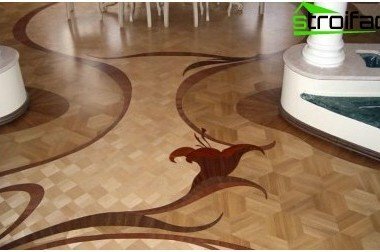 Choosing a modern floor coverings, it is necessary to strictly observe the technology of their installation. 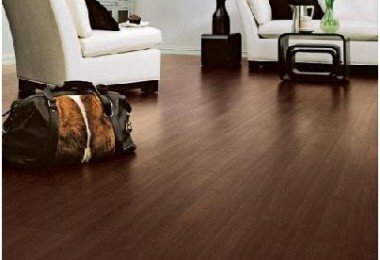 One of the technological requirements the device of floors from a laminate It is to prepare a firm, level base. This raises the question as to align the floor under a laminate with a minimum of effort and financial resources. 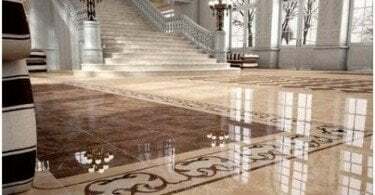 It is worth noting that not be achieved with good intentions, great savings due to the fact that construction materials required for floor leveling, can not be attributed to cheap goods. But they can achieve in a short time, a perfectly flat floor surface on which the laid laminate will look great. 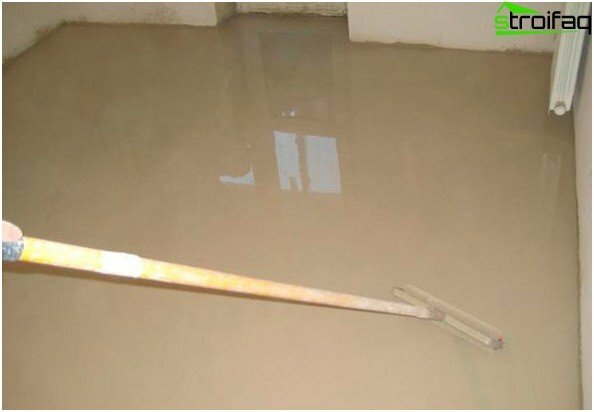 When you check the degree of horizontalfloor layout, conducted with the help of a water level, it appears that the surface has a slight deviation (0.6-2 cm), then perform the tie of self-leveling compounds. This technology is also called differently Polymer flooring. 1. The concrete base is cleaned of old coating, remove dirt and dust using an industrial vacuum cleaner. In the absence of this equipment in the course are brooms and rags. 2. The surface of the ground and covered with waterproofing material. 3. Use an electric drill equipped with a special nozzle, hold samovyravnyayuscheysya batch of dry mix. It does not depart from the recommendations, available in the instruction. 4. Diluted mixture is poured a small strip and spread with a spatula or spiked roller. 5. Next, kneaded the next portion of the mixture and poured another band floor. Important! Immediately the whole mixture was diluted impossible, as limited by the time of its application, which is 10-15 minutes. 6. The room can not tolerate the presence of drafts, to ensure even drying of self-leveling floor. 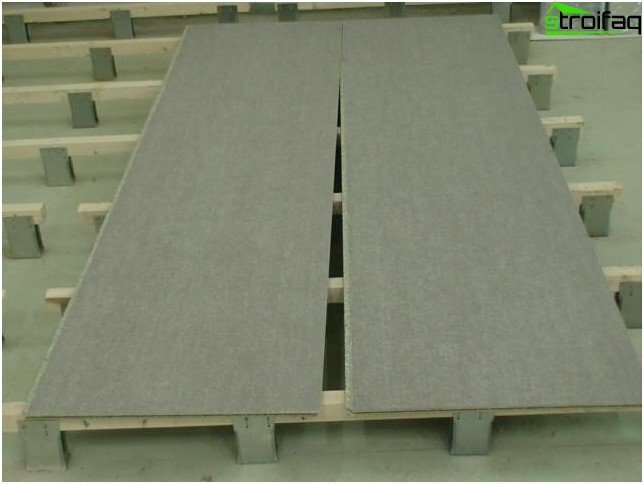 Stack laminate can be after three days, that is how much you need to complete solidification of the mixture. It measures the humidity level - if it is below 5%, the coating is placed directly on the self-leveling floor. If greater, the moisture proof film and using a substrate made of cork or synthetic material. This will provide better sound insulation. Important! If the level of the floor height difference is less than 5 mm, and the laminate is laid "floating" technique, the floors are not aligned. Just lay a vapor barrier film and a special soft substrate, which is "absorb" all the small irregularities defects. Monolithic screed suit in the room where the measurement of the floor revealed a significant level differences. 1. 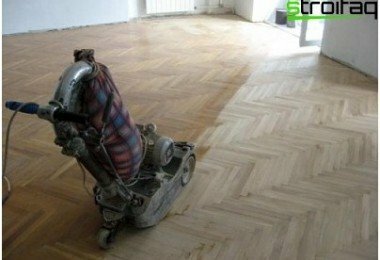 Before starting work, also carried out the dismantling of the old flooring, cleaning of debris and dust. 2. Next, using the level is drawn in pencil on the walls around the perimeter line of the future location of the floor surface. 3. Install beacons, which become guides used when installing drywall. Beacons are placed at a distance of 60-90 cm from each other, combining them with a level marked on the walls of the line. Beacons fastened to the base surface by sand-cement mortar, in which they are pressed to the desired depth. Either secure the long screws, making pre-punch holes in the concrete base and scoring them dowels. 4. Further, between the guide beacons pour the prepared solution (sand - 1 part cement - 3 parts water - 0.55 parts). You can stock up on ready dry mixes M200, which diluted with water in accordance with the instructions printed on the packaging. 5. With the help of a special tool, called the builders rule, spend leveling solution. This usually move along the guide rails. 6. After a day people can walk on the hardened screed. Therefore, at this stage carry out the removal of Lighthouse slats. Two-meter rule cut bumps and cracks close up of a freshly prepared solution of lighthouses. 7. biding for two hours, which is enough to ensure that the solution in the cracks started to set, and will be overwritten by the entire surface of the monolithic screed wooden spreader. 8. Next, screed is covered with polyethylene film, which will prevent the surface from cracking. You can wet the film instead of a couple of times a day screed water. The maximum of such durable floor will be only 28 days. Once you can start laying the laminate, do not forget about the vapor barrier and the substrate. 1. Carry out the preparatory work, similar to the method described above, and note the floor line around the perimeter of the room. 2. Perform the base of the building boards, all of them aligned with the help of a water level on the drawn line. If necessary, enclose a board of plywood pieces. 3. Carry out the fasteners aligned boards to the base floor, and then they are placed CFB board and carry out their fixation with screws. 4. The slits between the boards promazyvayut Rotband. 5. Lay the substrate and laid laminate. 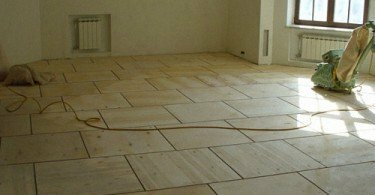 Dismantling of old wooden floors often difficult and fraught with high material costs. Different sizes of boards, is common in older homes, and sometimes can not be sanding. Therefore advantageous to align a floor by means of stacking sheets of plywood or particle board, over which still laid and insulation, solving another problem of the wooden house of the old buildings. 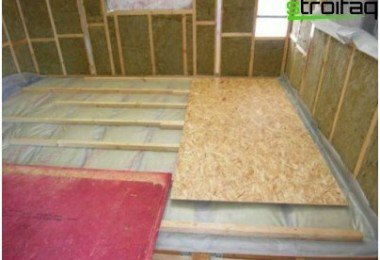 However, it is necessary to ensure a reliableA support that will not allow sagging plywood sheets. For this purpose, establish logs. As beacons are self-tapping screws, after installation of which the lag is assembled. The distance between the lags should be about 25-30 cm. On top of the log lay the leveling material and attach it. 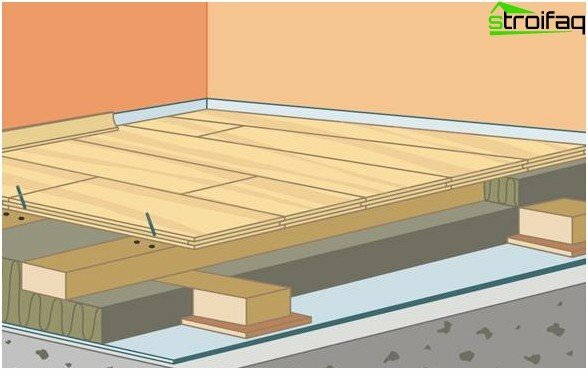 This technology of leveling the floors takes just 2-3 cm from the room, but allows laminate flooring. 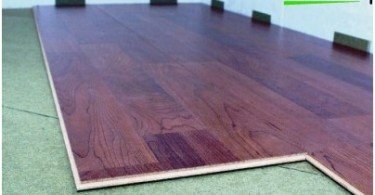 We hope that the article has given you a general idea ofhow to level the floor by any suitable laminate flooring for this area. 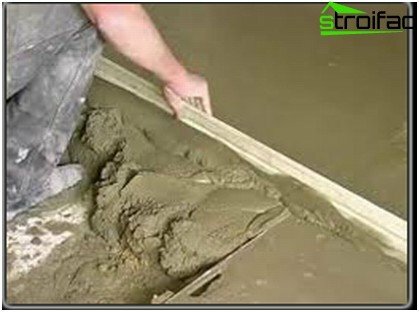 Depending on the type of base you can choose the most appropriate way of leveling the floor and try to implement it on their hands. In the absence of free time can turn to professionals, confidently and competently inviting them to perform all the work. With such a competent customer trash will not work.